Animated Film Reviews: Homage to "The Flintstones"
"The Flintstones" premiered on Friday, Sept. 30, 1960 in prime-time on ABC. 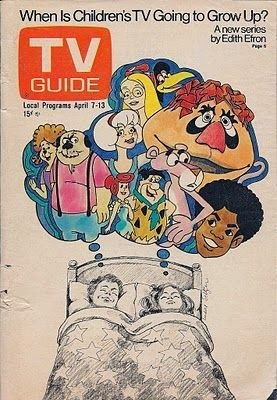 Curiously, the initial advertising featured Barney Rubble and Dino, the latter of whom appeared only intermittently in the series (though a regular in the intro). Perhaps it was because Barney was voiced by Mel Blanc, who was pretty well known even in those days. 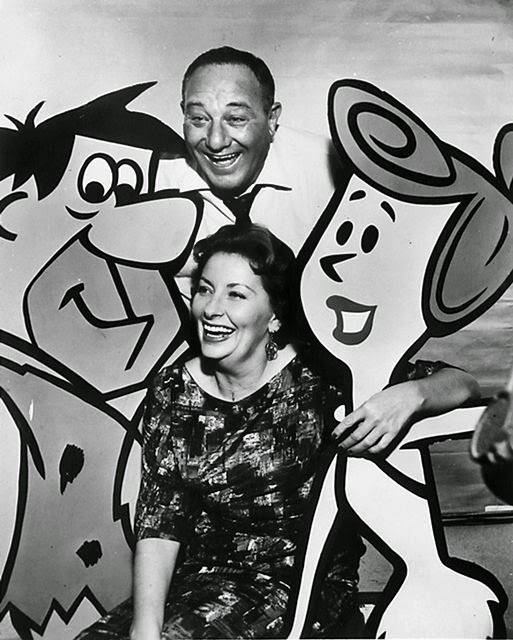 Alan Reed and Jean Vander were the original voices of Fred and Wilma Flintstone. Both were virtually unknown then - and, to be truthful, afterwards as well. Reed played perhaps the worst extortionist of all time in the original "The Postman Always Rings Twice" in 1946, and after that he didn't get anything else that was high profile. He personally invented the "Yabba Dabba Do!" catchphrase, it was not something someone else put in a script or suggested to him. That was something a good voice guy would do in those days, and he was working with the best: Mel Blanc. Absolutely nobody went around saying, "Wow, what a great voice actor that Alan Reed is as Fred Flintstone," but he was terrific. 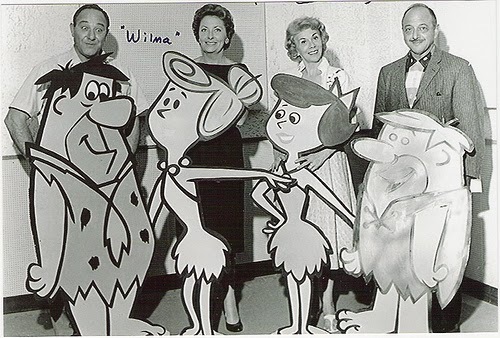 The four immortal voices: Alan Reed, Jean Vander, Bea Benaderet, and Mel Blanc. I love how casual this was, right down to them leaving the note on the wall as to where Wilma should stand, and Mel dressed like a proper gentlemen - apparently, his normal, everyday street garb, like the others. And "Wilma" has no mouth, I'm sure they all got a huge kick out of that. The only one who looked at all like their character was Bea, though Alan did bear a passing resemblance to Fred. Instead, you would occasionally hear someone say, "Yeah, the guy who is Fred used to do some acting" and then, even if they mentioned his name, you would immediately forget it. They also might mention while discussing some other role that Blanc voiced Barney, but that was never the point of mentioning him. That is how it was. I never once heard or remembered the name of the actress who voiced Wilma or the name of the guy who voiced Barney (in that context), and wouldn't know the names today without looking them up, but you know what? They were the most famous actors in the whole production. 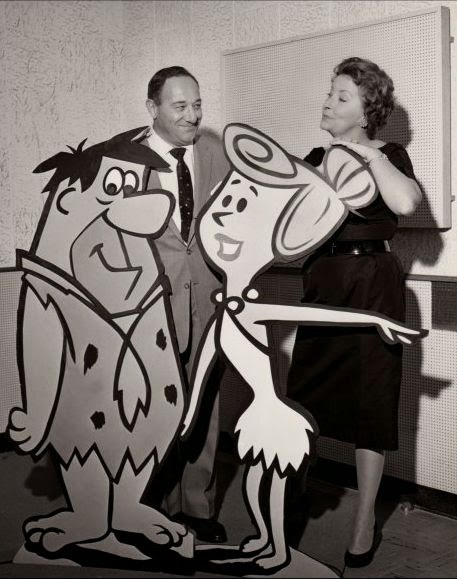 Betty was voiced by the wonderful Bea Benaderet, and Barney was the immortal talent, towering giant among voice men... Mel Blanc. 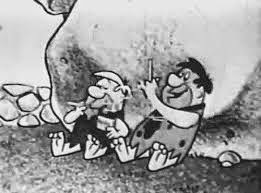 The Flintstones was sponsored by a cigarette company during the show's first two seasons, which was extremely common in those days. 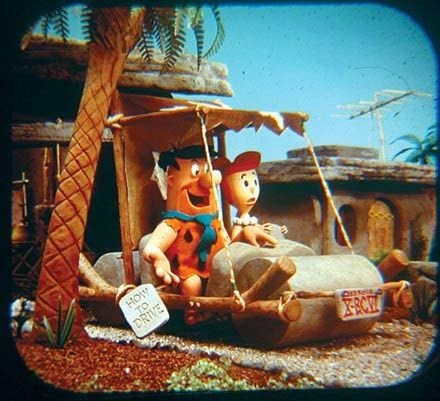 The show was intended for adults, not kids, so few complained about the commercials that depicted the stone-age characters puffing away on Winstons. Times were different, the commercials made them look like they were getting high, but nobody noticed that, either. 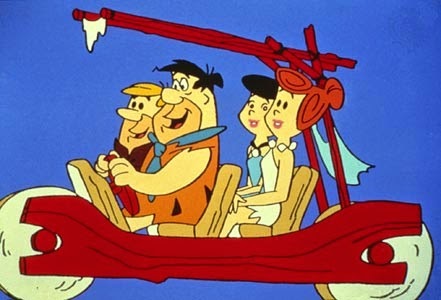 The Flintstones first telecast was on September 30, 1960, and the last Telecast was on April 1, 1966. However, that was not the end of The Flintstones, not by a long shot. 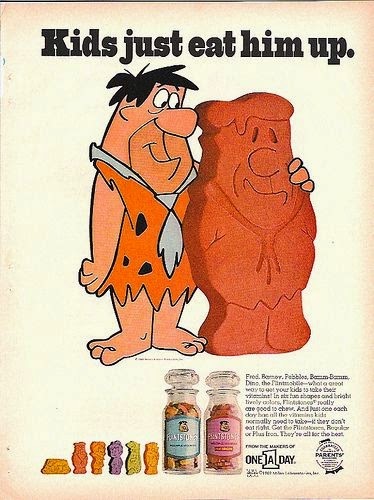 Flintstones vitamins were the vitamins of choice for kids in the '60s through the '80s. If you were going to take vitamins, at least they could be Flintstones vitamins. In fact, "Flintstones vitamins" became practically a synonym for kids' vitamins, like "Xerox" became the verb for copying paperwork or "Kleenex" became the noun for paper hankies. They are still very much around today. "Make sure they have their Flintstones!" And, incredibly, Pebbles has remained on the list every year since. There was renewed interest in the Pebbles name during the early/mid 1970s (Pebbles cereals were introduced in 1971) and the late 1980s/early 1990s (singer Perri “Pebbles” Reid had a few hit singles during this period). Bamm-Bamm has never made the list, but Bam has popped up recently thanks to the influence of Jackass star Brandon “Bam” Margera. Bamm-Bamm's catchphrase, of course, was "Bamm-Bamm" as he pounded his club. It was never explained why a baby would have a club. If they ever did a survey on how many dogs were named "Pebbles" or "Bamm-Bamm," I guarantee that the numbers would shoot through the roof. "The Flintstones," as noted, originally were intended for adult audiences wanting to see their dull lives in post-war suburbia lampooned. However, in syndication the emphasis turned 180 degrees to children. 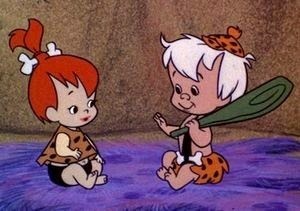 By the '70s, "The Flintstones" were on saturday morning cartoons along with lots of now-forgotten shows. Pictured on the below cover: "The Barkleys" ("All in the Family" with dogs), "Sabrina," "The Flintstones," "Pufenstuf," "Pink Panther," "Jackson 5," "Mission: Magic" (featuring Rick Springfield and a witchy teacher). The Flintstones has been on and off the air since. For instance, Alan Reed voiced the character in "The Pebbles and Bamm-Bamm Show" in the early '70s and also in other revivals that decade. 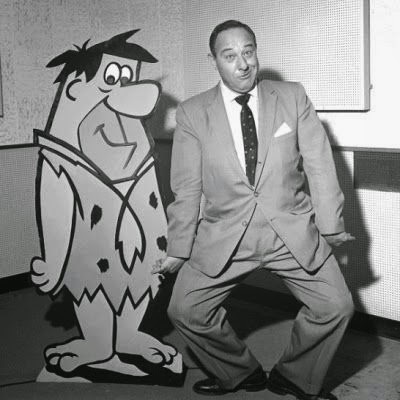 Reed passed away after an extended illness in 1977 while voicing Fred one last time for "Fred Flintstone and Friends." He was replaced by Henry Corden. 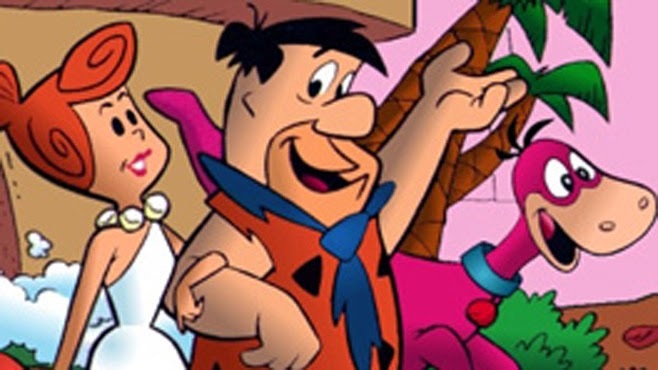 While that series soon ended, Corden became "the" voice of Fred and was in numerous Flintstones projects in the '80s and '90s. 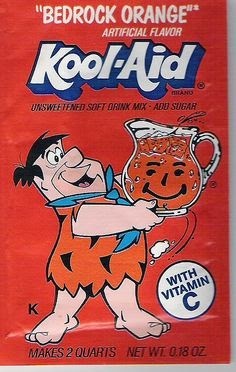 The Flintstones Kool-Aid packet, 1986. 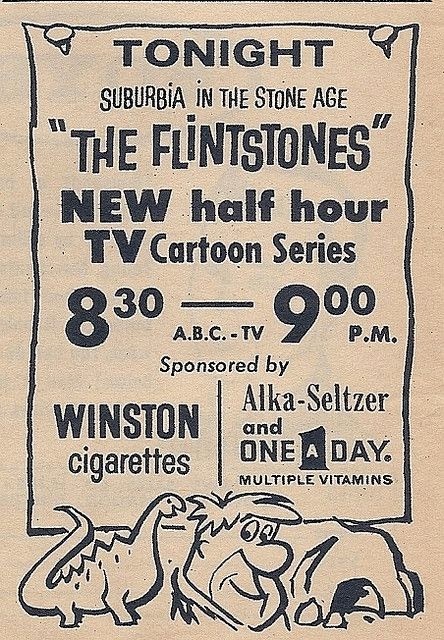 Flintstones ad in the papers during the '60s for the show "in color." The print advertisements still featured the Rubbles for some reason. 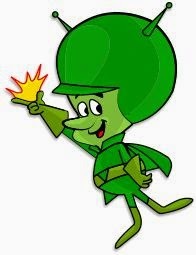 Once Gazoo showed up, it was all over. He was one of the most pointless and annoying characters ever brought in to ruin a show. One last look at Alan and Jean, quite possibly the most unknown but most-revered actors of all time. It's difficult to pull that off, I bet Alan and Jean could walk through any major town in the world and nobody would look twice at them - until, perhaps, they said something.